Teach Me Time! Clock | OhGizmo! I’m currently without any children, which I am perfectly happy with at this point in my life. I enjoy sleeping through the night without a child bounding into my bed at 4am because they’ve decided it’s time to get up for the day. 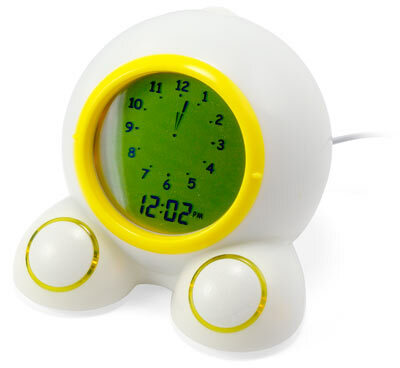 Here’s a neat little alarm clock that may help parents who have exactly that problem. This cool alarm clock serves a variety of functions. First, it has a 5-stage talking “game” which will help your child learn to tell time. Both a digital and analog clock are shown so that they can learn to read both. It also has a special “Ok to Wake” alarm, which lets them know if it’s still to early to wake you up. You’ll set this specific time on a hidden control panel, and during sleep time, the clock will glow yellow. Once it is time to get up, the light will turn to green. The clock even serves as a regular alarm clock equipped with snooze for when your kid has to wake up for school. This is definitely a cool product that I would recommend to any parent of a small child. For $30, you can’t find a better clock for kids.